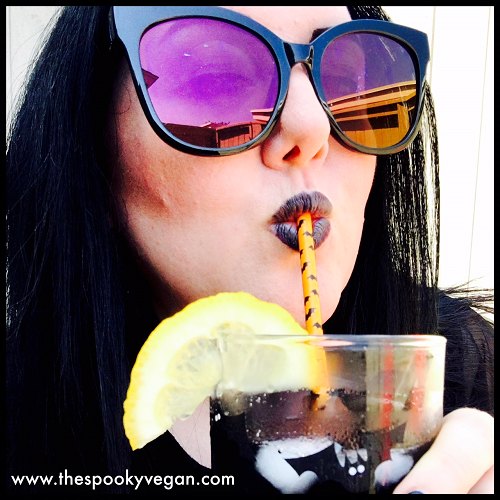 Goth lemonade, made with activated charcoal, is an eerily easy way to spook up your summer, whether you make a refreshing glass for yourself or an entire pitcher to serve at your next goth pool party (see other goth essentials for summer HERE). It is the perfect drink to make on hot, lazy summer days and has the added bonus of matching your clothes...and soul! No to mention it is an eerily impressive beverage that photographs wonderfully! 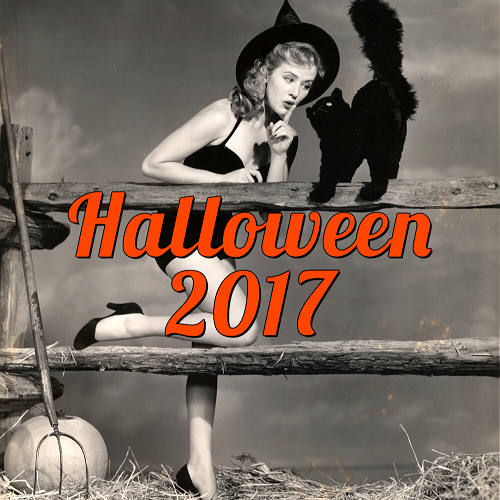 Besides serving this in summer, it would also work just as well for Halloween. Check out the quick and easy recipe below. 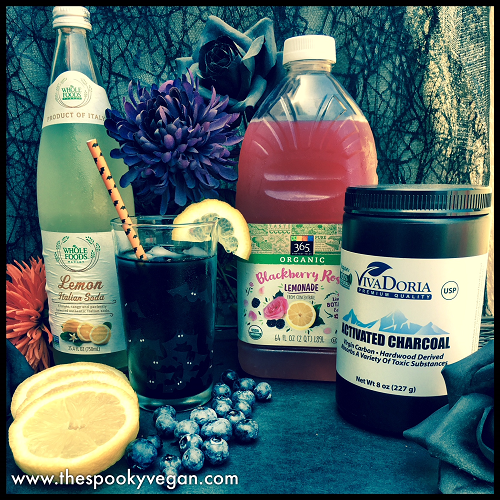 A word of caution before you decide to make this, though - activated charcoal may interfere with medications you or your guests may be taking, so be aware of this for your own sake or if you decide to serve it to others. 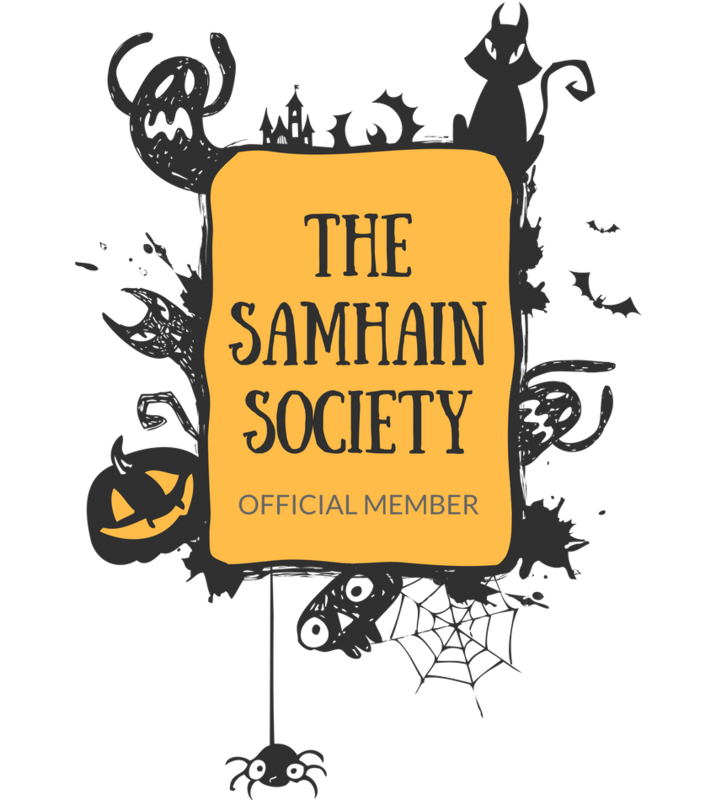 If you do decide to serve it at a party, I recommend letting guests know it may impact the effectiveness of any medications they are taking, perhaps with a clear, attention-grabbing sign or note by the punch bowl. 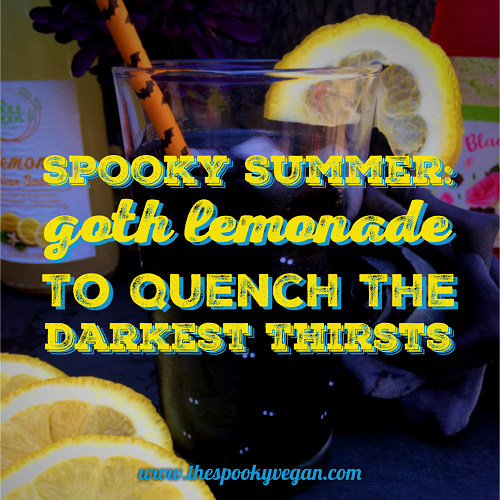 With that important note out of the way, let's get to the goth lemonade that will complete your spooky summer! Optional: garnishes like lemon slices, blueberries, sliced strawberries, mint leaves, edible flowers - whatever you fancy! 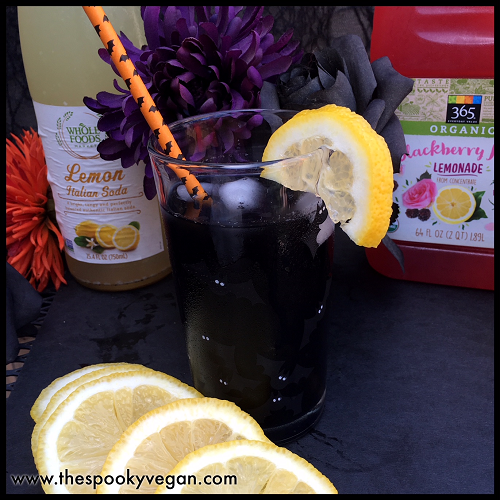 Pour lemonade into a glass, pitcher, or punch bowl (I suggest using a glass container since the charcoal may stain plastic) and add a 1/2 teaspoon of activated charcoal per 8 ounces of lemonade - be careful you don't use too much charcoal, as a little goes a long way! I also suggest mixing the lemonade and charcoal in a glass or pitcher set on paper towels as the activated charcoal is messy, tends to get everywhere, and can sometimes stain. The beverage should just taste like lemonade and will not taste like charcoal (if it does or if it is gritty you may have used too much charcoal). 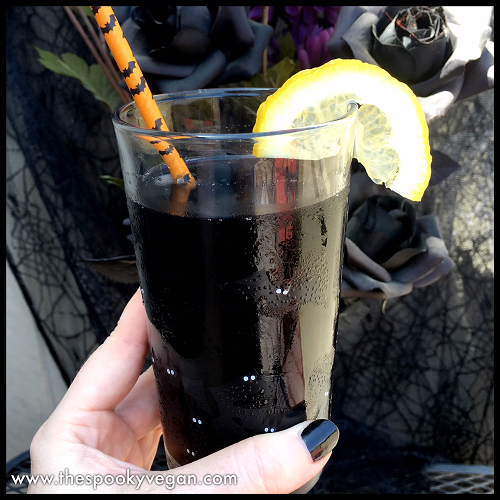 It should have a deep black color when prepared correctly - you can also freeze some of the mixture in ice cube trays (or skull ice trays) and use those with the goth lemonade so it doesn't get diluted and maintains the dark black color. Feel free to garnish the goth lemonade with lemon slices, blueberries, strawberries, mint, or anything else you fancy! 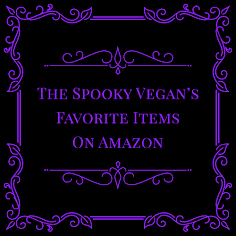 Serve and enjoy to your little dark heart's content! And again, be cautious if you are taking any medications and don't serve to others who may be taking medication you might not be aware of. If you plan on serving to others, make a sign warning them of possible drug interactions with the activated charcoal. 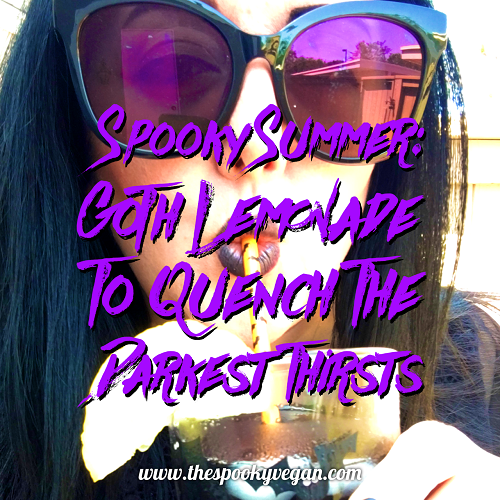 Have you made Spooky Goth Lemonade before? 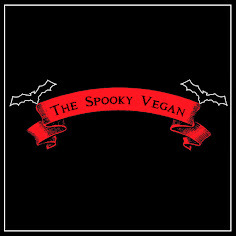 I love having it when it is hot to capture those spooky summer vibes! Wow - I never thought of using charcoal to turn beverages black.